yerevan letters #3: heaving (part one) — anna bianca roach. “you have a better view than the president.” this was said to me by someone as we looked out into the city from my balcony, which gives onto the bend in the hrazdan river that gives the gorge its name and shape. there, just across the water from me, the house of serzh sargsyan is perched just above the children’s railway, nestled in thick, rich foliage. as she finishes saying her sentence, her eyes open wide as though she had startled herself: sargsyan is no longer the president – he is no longer even the prime minister, as he resigned just a week ago, days after having appointed himself, triggering mass protests throughout the country. it is a mansion, stately, sleek, and the same colour pink as the other buildings built out of volcanic rock. here, for some reason, it is the same colour as the sunset some days. the neighborhood is oddly shaped, following the lines of a hill so steep it is actually a cliff in some places. from the window i’m sitting at, you can see the houses of baghramyan street neatly lined up. the neighbourhood’s verticality gives it a strange sense of voyeurship: i’ve never met my next-door neighbours but i know they are police because i see them sitting on their porch during their smoke breaks. you can tell by the architecture of the neighborhood that it is, or at least at some point was, quite wealthy. the family two houses over has walls of a brilliant, sparkling white and a bright blue oval-shaped pool that’s been empty since i got here. in fact, of my immediate neighbors, at least four have pools, and the back yard under my balcony has a symmetrical design and a concrete structure in the center that was obviously supposed to be a fountain. at the same time, there’s a strange, kitschy clash between these signs of abundance and a strange scarcity: the police officer’s fence is made out of chicken wire and the would-be fountain is filled with the remains of a would-be DIY construction project. the next roof over is made out of tin. of all the houses visible from here, sargsyan’s is the only one that demonstrates absolute wealth, the sparing of no expense. it is clearly modern yet built in a consistent style, which means that unlike most people and even unlike the government, he did not run out of money during the financial crisis in two thousand and eight. i’ve described my apartment before as sitting in a wrinkle of the city. i used this term because though it is in a strange, windy, and largely hidden neighborhood, it is in fact quite central not only to the city itself but to the revolution that has happened around me this month. if you follow my street in one direction, you will end up at the intersection of proshyan and baghramyan, a stretch of road that hosts the national assembly, the parliament building, and the british embassy. going in the other direction, and weaving through backstreets and parking lots, you’re just five minutes from pushkin street, a place where people go for bar-hopping and drinking. if you, like me, were to take bagramyan home on april sixteenth, you would eventually find baghramyan barricaded with a line of armed police standing behind barbed wire. if you followed proshyan to demirchyan, the street leading downtown, you’d then run into city buses filled with police and, depending on the time and day, one or two large tanks. 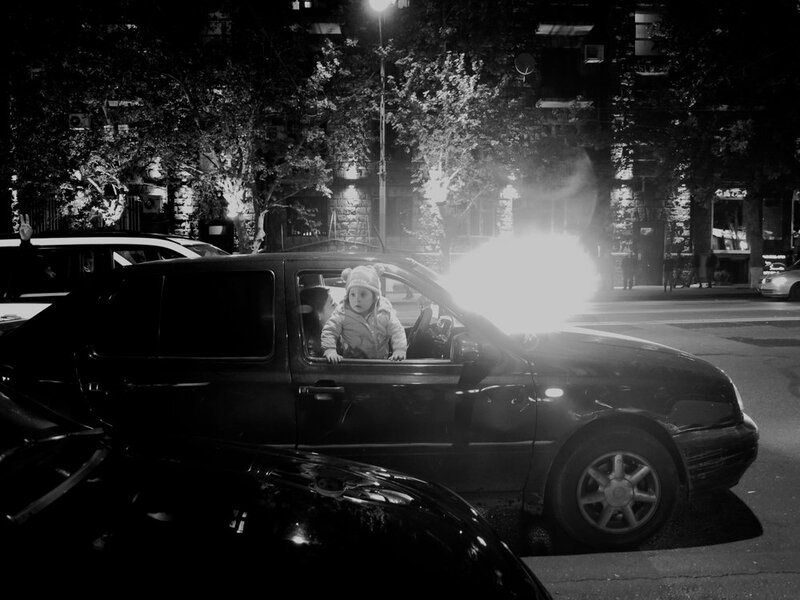 a child looks out from a protesting car as another car behind it flashes a strobe light. on the seventeenth, you’d find the entire affair carnivalesque. elderly women sitting on benches pulled into the middle of main streets, military officers taking selfies with protestors. understanding some of the language here, you hear tidbits of the conversations in passing: among the older generation, they’re about pride of the children and their devotion to the movement; among the youths, they’re about the movement and what they think of its various leaders. here, you learn that when the city is run by the people, the space is for the children. children are lining the streets, cheering and chanting; children doing tricks on their bikes; children are using their scooters to drive through the barricades. with the heavy presence of children comes a youthful, cheerful exuberance. they’ve been calling it a velvet revolution, but at least in the early days, i think bubblegum would be more fitting. that’s the only way to communicate not only the peacefulness of it but the joy. republic square is the beating heart of the city and the central nervous system of the protests and the gathering there grows in size every time you see it. for the eleven days, every night, you go down to the square; you run into people you know and you gossip. about opposition leader pashinyan, about president/prime minister/soon-to-be-deposed autocrat sargsyan, about the mutual friend who got detained, about what you did last night after the protests. if you remember the last day of school in your small suburb, where you left the classroom only to meet with the very same people that night at the park, you sort of know what it felt like in the first part of the revolution. and you realize he’s right. until now the protests were simmering and it seemed like people were calling it a revolution in the same way some people name their children joy: out of hope that if you say something out loud for long enough that it will become true. but today, an unspoken rule has conquered the city: “honk if you are against serzh sargsyan.” this seems small, but it is not: it means that the drivers have joined the protests as well, and that the last of the government’s arguments to put down the movement – that it is “disturbing the peace” and “impeding the city’s freedom of movement” – doesn’t mean anything anymore. whenever one car honks, for any reason, it immediately initiates a symphony of honks: long continuous honks, honks that punctuate the opposition slogan (“qayl ara merji serjin”), honks that spell out the tempo to a song another car is playing, honks in no particular order. this means that since protests began, every act in the city – every walk, every grocery trip, every commute to work – is been serenaded by the honks of the revolution. suddenly it is no longer a movement in the city: it has become indistinguishable from the city. it is woven into the streets and in the lives of the people that live on them. crowds on republic square on april 17th, listening to a speech by nikol pashinyan. that night republic square fills up entirely, so much so that people are climbing on the walls to see pashinyan speak from the centre of the square. i’ve heard it was designed to be too large to hold a revolution, so that the people in it are shrunk immediately by the greatness of the empty space around them. if this is true, then it has failed: it is so full you cannot see the ground and from here on we know that the people have won. on this night for the first time the revolution does not taste like bubblegum. there are no children in the crowd, there are few women, and nobody is smiling anymore. when you run into people you know, they ask: “aren’t you afraid to be here alone?” they say the police will deploy violence again and people remember the bloodshed of 2008 far too well. it is eight in the evening and there’ve been rumours whispered through the city that police were ordered to “clear out” the streets by ten. i leave much earlier. as i sit at home in the windy neighborhood tucked behind the national assembly, i begin cleaning. i open all the windows so i can hear anything i might hear from baghramyan through my balcony, but the echoes from the gorge drown everything out. in complete silence, i sweep, i reorganize the kitchen, i rearrange the fridge, i alphabetize the spices, i scrub the stovetop. it is nine fifty-five and my roommate isn’t home yet. i hear from friends on the streets that they’ve been empty; that at republic square, they have started releasing a foul-smelling gas into the crowd to disperse people. the silence in the streets is so loud it is heavy, like someone has just thrown a weighted blanket over them. it is the same silence you get when it snows for the first time, a silence everyone has wordlessly agreed to - but it is not wondrous childlike this time, it is frightened. my street is lined with police on both ends. i watch from my balcony as the lights in the houses around my turn off, one by one. the city soon drifts into an uneasy sleep: there is much to be done in the morning. we do not know what yet. but it will be much.